Orange soda, to me it has a kind of mystique- I don’t know anyone who exclusively drinks orange soda, most people like it yet it seems to be more of a novelty beverage. Although, I must just not know the right people because orange soda is sold at every gas station, mini-mart and grocery store so obviously it’s popular with someone. Crush was actually a little hard to find and I could only find it in glass bottle but there’s nothing wrong with that. My friends Mark and Sarah sat in for this round, lending their expert tastebuds to evaluate and ponder these drinks of orangey carbonation. Right away Mark noticed the strong ultra-sweet orange smell, like orange candy (which it is) and found it to be very pleasant. Sarah felt it had a slightly weird after-taste, we realised it was because of the rosin, actually listed as “ester of wood rosin”. It actually wasn’t bad though but after we read the label it seemed to taste even more “rosiny”. We also thought it had the deepest orange color. 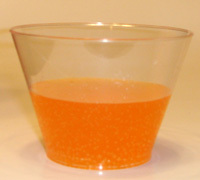 Fanta had the same strong orange smell. We found it to be the more fizzy and sweeter than Sunkist. It seemed more artificial and somewhat flatter in flavor. Crush had lighter smell but we found it to be overwhelmingly sweet. We all agreed this was the most artificial of the three and Ethan described it as “water from a pool”. This lacked any real flavor and was not enjoyable at all. We started out thinking these would all taste pretty much the same but it was interesting to find such clear differences. Sunkist was the most favorable, even with the wood rosin, maybe that’s the secret ingredient that makes this drink the most appealing. Fanta was the runner up, a bit more tart and corn syrupy but still had a decent orange flavor. We thought Crush would be the best but were surprised that we couldn’t finish our little tasting cups. Maybe it had to do with Ethan comparing it to “pool water”, whatever that means but it made sense at the time. We all felt that it lacked orange taste and was way to sweet. Although, for what it’s worth, I think it has the best logo. Orange you going to vote? What a cool blog!!! I found you on One Food Guy’s blog. I love your format…how did you come up with it? I’m definitely going to stay tuned! I’ve just started out with my blog – any tips? Again, great blog! Came over from Snackerriic for what I hope will be the first of many visits. OK, Sunkist may welll be the best of these three. The best orange soda out there is definitely Mirinda but sadly it’s not available in the United States. Wow! You have got to be crazy to not like Crush! Crush is the original Orange soda, and everyone knows you can’t beat the original! Crush used to be the best, until a period back in the 80’s when food companies began to actually try to get healthy. Crush added “10% real fruit juice” to their drinks and the flavors tanked. They still have a decent grape soda, though. If i have a choice, its none of these. When it comes to orange,grape,strawberry -you know your fruit sodas, you gotta find the cheapest ones there are, like best choice or equivelent cheapness. I think theyre the best, the more fake the fruit flavor, the more i like it. Im under no illusions that im drinking juice, and i want it to taste like soda not juice. crazy sugary syrupy fake fruit drink. There goes my “glass bottle sodas taste the best” theory. “Who loves orange soda?” “Kel loves orange soda!” “Is it true?” “Mmm-hmm. I do, I do, I do, I do, I do-hoo!” -Kenan & Kel. Dear LORD, they’re orange! I’m sure British Fanta and Sunkist aren’t that colour – are they? Orangina is nice, if pricey, and very popular in France. I used to like the Dollar General “Clover Valley” brand Orange Soda from the late 90’s to the early 00’s. It had a nice smooth texture and mellow (not watered down) flavor. I used to put it in a glass and stir it up to give it an even smoother texture. Then around 2001 they must have cheapened the recipe and started watering it down while adding more corn syrup to compensate. Sunkist is my favorite orange soda. The diet version is also packed with flavor. 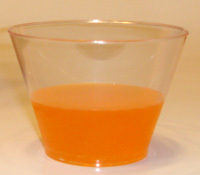 Ester of wood rosin is actually what’s called a “clouding agent,” it has no flavor of its own, but it gives beverages a cloudy, juice-like appearance. It’s citrus-based. I can barely vote for this. I exclusively like all sodas except Coke Zero and any forms of it, Diet Sierra Mist and Sprite. I specifically prefer caffeine and if you look at the bottom of the Sunkist label, you’ll see that it has 27 mg of caffeine per 8 fl oz. Ever since Dr. Pepper-Snapple has had Pepsi make Crush (Orange specificly), it has become a vastly better drink. I believe it is more toward the best orange soda ever, Slice, and replaced probably the worst, Tropicana. They are also bringing in more flavors, such as Cherry and for a LTO in September, Lime! 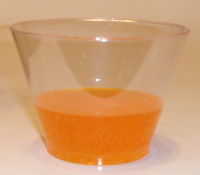 I think the ester of wood rosin in Sunkist has since been replaced with ester gum or something like that. To be perfectly honest with you,I think that the reason Crush tasted the worst is because of the glass bottles. Either way,have you heard of Jolt? I think it first came out in the 1980’s in Cola,Electric Blue,and Red Eye. The Red Eye one is probably a cherry flavor. Either way,ever since Jolt became an energy drink(Believe me,it wasn’t that long ago. )they’ve discontinued Red Eye. The 5 flavors they have now are Power Cola,Blue Raspberry,Zero Carb Blue Raspberry,Orange,and Grape. If you wanted to do a rematch,you’d have to go to Rite Aid,7-Eleven,maybe Walgreens,or your local convienence store. You know, I’m not a huge Crush fan, but you’re sure that in no way the taste of Crush wasn’t affected by the glass bottle? I’d think that they MIGHT have Crush up there in a two liter bottle or a twelve pack or something. 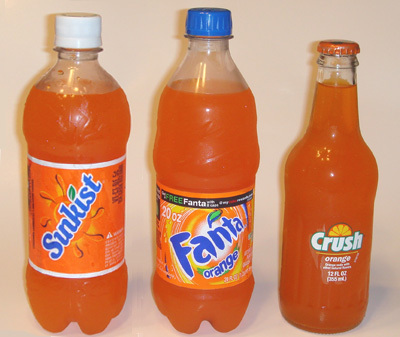 And even though the Crush logo was probably different at that time, Sunkist and Fanta have both changed their logos and I prefer the one Sunkist has, followed by Fanta. For Halloween I’m going to be a can of orange soda and I wanted to know which soda I should be. This blog post really helped me. I decided to google which to be and your link popped up. I read all that you said about the orange soda, and decided to be what you picked as your favorite. Sunkissed is probably not the one i would of picked, so I’m glad I read this because I told my friends I was probably going to be Crush. I think Fanta and Sunkissed are dead even in taste even though I agree they don’t taste the same, but that’s just my 2 cents. I love orange sunkist and grape sunkist is fantastic. They taste like they have more of a spritzey taste. Drink them all the time. The reason Crush tasted the most “artificial” is because it uses natural flavors that are not from oranges. It’s probably from some kind of plant. After all, it says “naturally flavored with other natural flavors”, which means it uses natural chemicals other than orange to make the flavor. So it’s not artificially flavored, since it comes from natural resources, but it’s simply not flavored with the natural flavor chemicals from oranges. I have to go with Crush. I have GERD and cannot tolerate Sunkist. I get heartburn with Sunkist but not Crush. Me and my friends were arguing about this, I found this “Blog” and we agreed Fanta was best. I like Sunkist the most personally but sometimes it’s harder to find out here in Hawaii. Also, a huge difference that wasn’t mentioned in the “comparative study” was that Sunkist is the only one of the 3 that contains caffeine. Crush and fanta do not and to me that’s almost as important as the better taste of Sunkist.